and it’s not a city in China. I mean, it really isn’t. Here’s the deal as I see it. 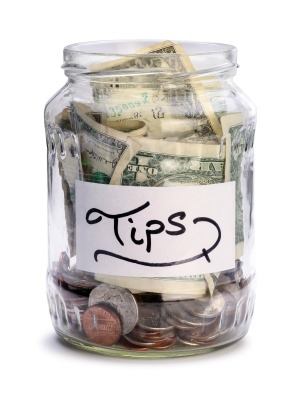 Tipping your server at a restaurant is one of the few actual service for pay that we have in our economy. I sit down at a table, and from that moment I have a certain level of expectation of what will happen. THis person will get me something to drink, take my order, get my order, and be fairly nice about it. If I’m in a chatty mood, they’ll read this and they’ll be chatty. If I’m trying to have a conversation which is fairly private, they will notice I’m on the verge of tears or something and space their “is everything ok, can I get you anything” question appropriately. Thing is that we also have this reasonable expectation of any kind of employee. The reality though is that there is less of a concrete expectation of what will happen and when. You go to your office and you sit at a desk and you do stuff. Like write a blog for instance. Or surf the internet for funny cat pics. Or watch endless repetitive footage of Boston manhunts. You’re not doing work. But if someone doesn’t leave you 20% of your pay on your desk when you leave for the day, it won’t be a surprise or insulting. In fact, you will still get a check probably direct deposited if you have the kind of work environment that allows generic mediocrity. I think what we get caught up in with the whole “service industry” is we have this thinly disguised view that says you are SERVING me and that is like a poor cousin to VOLUNTEERING for me. And if I throw you some charity, you should be grateful for whatever I give you because you are needy. Anyone who has ever waited tables or slung beers knows this. You feel like a 2nd class citizen. Get me this, you got that wrong, there’s too much ice, I didn’t want a lemon. And I hear you complaining – well they should get a better job. Or they choose to work for $2 hourly and they better well earn the 15-20% I am thinking about leaving them unless they don’t respond to me snapping my fingers at them. But Grace says something else to us. Grace says no one is treated how they deserve to be treated. And who gets to decide what you deserve in the first place? You say you work hard and I’m sure you do. I have my moments of working really diligently and efficiently. Then I have moments of looking up Star Trek episodes. At the end of the day, neither of us get what we “deserve” because no one really knows what that looks like at any given moment. Instead, let us treat each other as if they deserve the utmost respect and dignity (which they do if you believe we are all in God’s image) and watch them rise to the occasion. There is a great post on this today at Gospel Coalition. I was going to post quotes from it and found that I was quoting the entire article. It’s that good. Let Grace rule the day, every day.